Things to do in Vienna May 2019: May has rare opportunities for music and outdoor lovers in store. If you need additional tips for classical music events, check my tips in Vienna concerts. Things to do in Vienna May 2019. 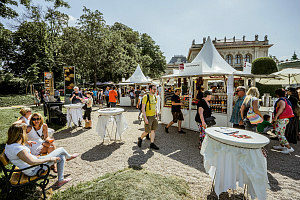 For three days, Vienna’s Stadtpark will turn into Austria’s biggest food fair. The more than 190 stalls are a good opportunity to eat your way through Austrian food, from my beloved Austrian sourdough bread to Viennese potato gulash, cheese Knöpfle from Vorarlberg, and sweet poppy seed gnocchi from Waldviertel. Apart from that, you can watch a chef create themed tasters of Austrian regional dishes. At the ‘origins tent’, Austrian farmers and bakers show their work traditions. Between 11th May and 1st July lovely Wiener Konzerthaus will stage its 39th International Music Festival. Expect a rich menu of grand classical performances, from a Mozart piano concerto and Bach‘s Goldberg Variations to grand symphonies by Haydn and Shostakovitch. Find out more. 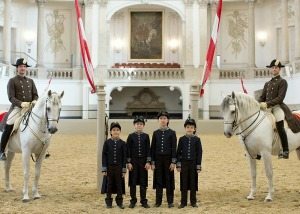 It just happens seven times a year that the Vienna Boys Choir joins up with the Spanish Riding School. In May, they will stage their exceptional program ‘A Tribute to Vienna’ twice in the grand baroque winter riding hall. Find out more about ‘A Tribute to Vienna‘ and how to get tickets. You may know the Musikverein’s Golden Hall from the Vienna New Year’s Concert that is broadcast worldwide each year. May will get you the opportunity to experience top quality concerts there, along with other local music fans. You can choose between harmonious Haydn/Shostakovich/Weill and Mahler’s Ascension Symphony with powerful vocal soloists and a choir. Check out all concerts in May at Musikverein, and my Vienna Music Festival guide. Tickets: get tickets for Musikverein concerts in May. Things to do in Vienna May 2019. 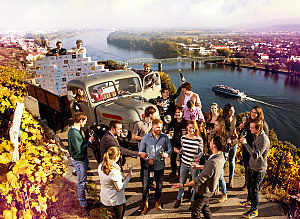 On the first weekend in May, wine lovers from across Austria will flock to the Danube valley near Krems and adjacent wine growing areas. For the 25th time, 36 top local vintners of this famous wine region will open their wine cellar doors and fresh wine bottles to share their treasures and wine growing knowledge. Simply get a ‘Tour-de-Vin button’ for EUR 25 at any participating winery, which entitles you to wine tastings across all wineries. In addition you can participate at various events, from vineyard hikes to a champagne workshop (with English explanations). Things to do in Vienna May 2019. Each weekend, Viennese flock to their ‘house mountains’ Kahlenberg and Leopoldsberg. They are packed with lush vineyards, woods, panorama views, historic buildings and a good dozen of wineries. Equally popular is the Danube Island. I’m not a great biker but joined a similar tour in the summer of 2016. Since then I have become an e-bike fan. 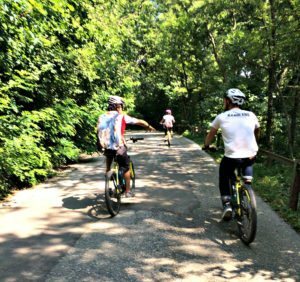 This easy e-bike tour is the best outdoor fun in the Vienna Woods and Danube Island . Read more. 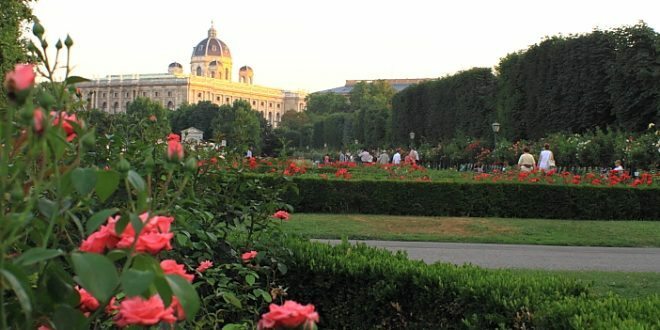 Things to do in Vienna May 2019. We may share the same experience here but I think off-path activities and encounters with ‘natives’ always feel special: Perhaps because they add authenticity to a holiday. 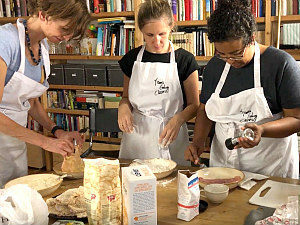 In my home city, you can connect with a group of Viennese foodies by cooking and dining with them at their own homes. (That’s actually me on the left in the photo, with two of the hobby cooks.) Find out more in Vienna cooking classes with private dining. Things to do in Vienna May 2019. Austria’s Christian churches invite to their annual free ‘open night’ event’Long Night of the Churches’. You can visit free church concerts and theatre plays, join local tours (mostly in German) and exhibitions, and climb up domes and church towers in 188 Viennese churches. My personal favourite: hearing the monks of Heiligenkreuz Abbey chant Gregorian Chorals at the Bernardi chapel in Heiligenkreuzerhof (tbc). See the full program on the event website (German only). Things to do in Vienna May 2019. To celebrate its 150-year anniversary with everyone the Vienna State Opera will take its soloists, choir, and orchestras outside for a spectacular concert. Unusually, the open air stage will not just cover the square next to the opera, but all the space around the building. Prepare for some fun surprises! While you will enjoy the city of Salzburg whatever the season there are activities in the surroundings that are only open in the warmer months. Just take the lake district, Salzkammergut, for example. Boat rides on its most famous lakes like Hallstaetter See, Wolfgangsee or Attersee are mostly possible between mid April and October. Likewise, a visit to the Giant Ice Caves at Werfen is only doable between May and October. Find out more about day trips from Vienna to Salzburg in Vienna Tours to Salzburg. 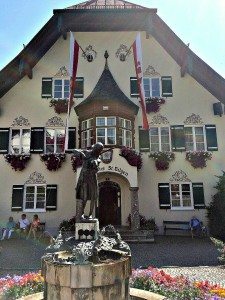 The Danube Valley of Wachau, a UNESCO World Heritage Site, and a boat ride from Spitz to Duernstein was one of the first trips I took my husband on to show him the best of my home country. This well conceptualised tour covers all that we had seen. The highlight is definitely the extended boat ride from Spitz to Melk, and the fantastic baroque abbey of Melk which towers over the Danube. Many villages and towns like Krems date back to the Middle Ages (1305), boasting houses with coats of arms and metre-thick walls, big city gates and watchtowers. Access details of the Danube Valley Day Trip. 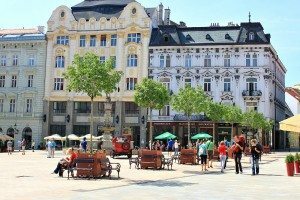 Many readers ask me about my thoughts on a boatride on the Vienna Danube… and I always come up with Bratislava. The stretch of the Danube between these two cities is picturesque and green. I travelled from Central Vienna in just over an hour by high speed catamaran and had the whole day to see a gem of a European capital. You can find the full story and travel details in my review of our mini Danube cruise.